The ultimate Wryst review with full details behind the origin and inspiration of the watch design. 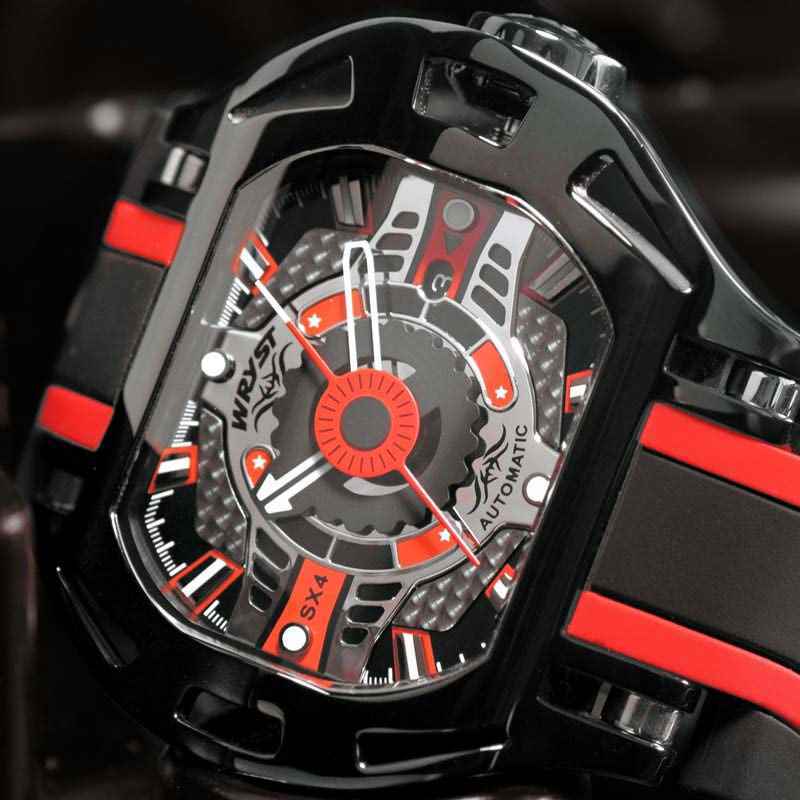 Many are talking about the technic and futuristic watch design created by the Swiss watch brand. Today we want to clarify everything about the inspiration behind it, and clarify any false assumptions. There are several Wryst watch reviews available online. Some are misleading and incorrect. Suppositions about the origin of the Wryst design have appeared online. This is a risky and adventurous exercise dared by only very few. The attempt by Arial Adams, a journalist at Ablogtowatch, is certainly the worst one. 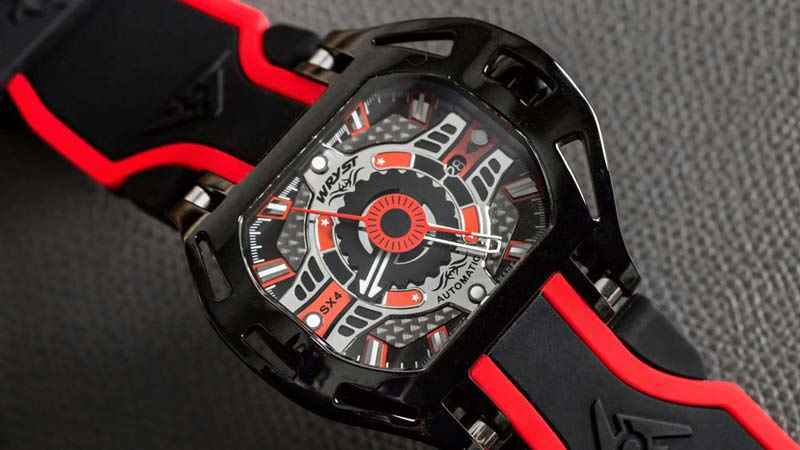 You can find here the Wryst Racer Automatic SX4 watch hands-on. Some aspects of the content on this page are totally genuine and legitimate. But other ones are a rather childish and immature hypothesis. You can download the entire review should it ever becomes unavailable online. At wryst we take to heart the following statement: "If you're going to do something, do it right or don't do it at all". There is a lesson to learn here from one of the most influential personalities in high-end wristwatch media. 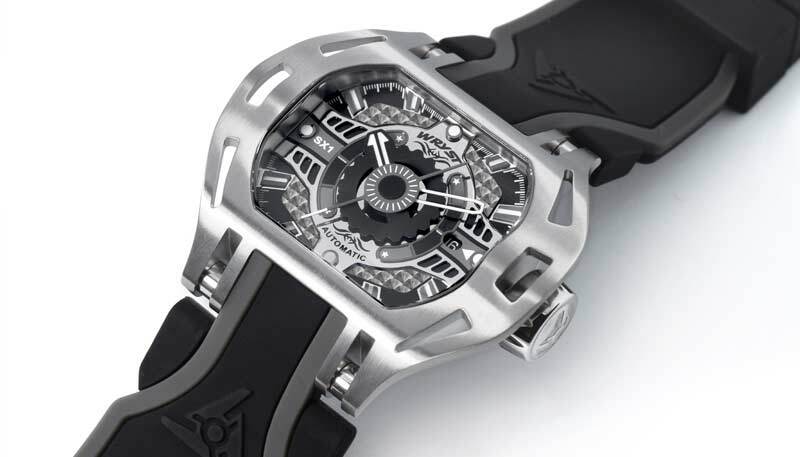 One of the most controversial aspects of the Wryst sports watch is the case overall shape. Rightfully, there is nothing like the unique curves and shapes of the Wryst timepieces in the watchmaking industry. Firstly, Swiss watch designer Jacques Fournier is at the origin of all and every watches produced by Wryst until this day. Here we will review all the aspects of the first Wryst Airborne collection released in April 2012. Since then, the same design has inspired other collections. For example, the following sports watch collections Wryst Shoreline, Wryst Motors, and Wryst Elements. 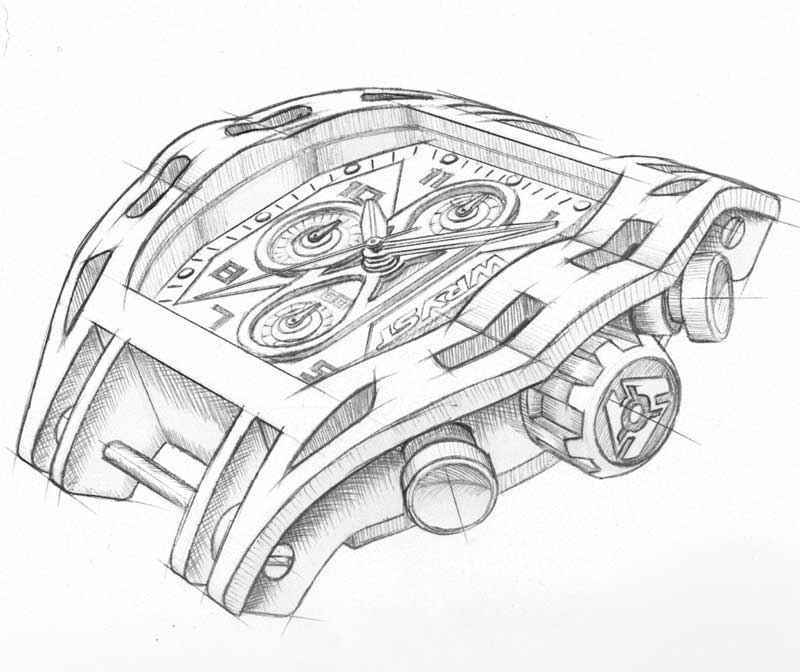 In 2010, strong of a long experience in designing luxury watches, Fournier decides to launch his own brand. His love and fascination for watches were actually rather frustrating. Young, he was desperately looking for a watch that has a more technical and industrial aspect. At the time he found most of the timepieces available were too plain, too classic or simply too identical in aspect from one to another. But later designing modern and inspired watches for other brands was just not enough. There was clearly a gap in the market that he would fill. By creating a unique and "never seen before" sports watch produced in limited edition made total sense and would fulfill his dreams. In this Wryst review about the timepieces, we will look at all and every single aspect of the watch design origin. 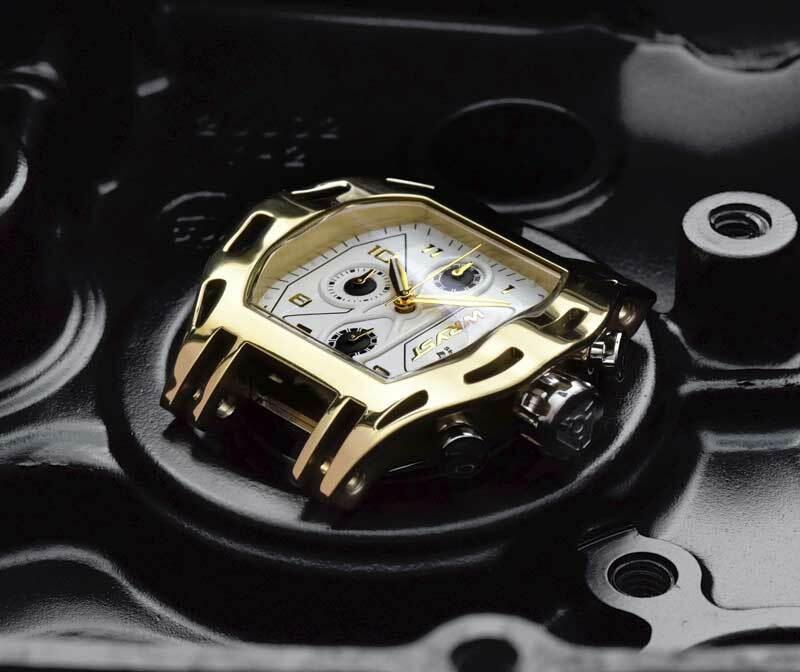 Huge fan of action sports and racing, it was logical for the new watch brand to take a closer look at engine parts. The body of the watch then started slowly to take shape. The flank of the case could, for example, reflect the stunning aesthetical look of an engine manifold. The curves and segmented 'comb' of a six cylinder V6 or height cylinder V8 car racing engine just looked stunning. After a few hand sketches, the 3D CAD construction soon started. There was also a few novelties the brand should use. The integrated bracelet attachment to the body was an important feature. A timepiece accidentally detached from the wrist is something that should never happen. This could lead to losing the watch unintentionally. Conventional watch case lugs are just not exactly safe enough. For the Wryst sports watch it made sense to imagine a way to improve this. The technical and secure four-part screw system came to life naturally. 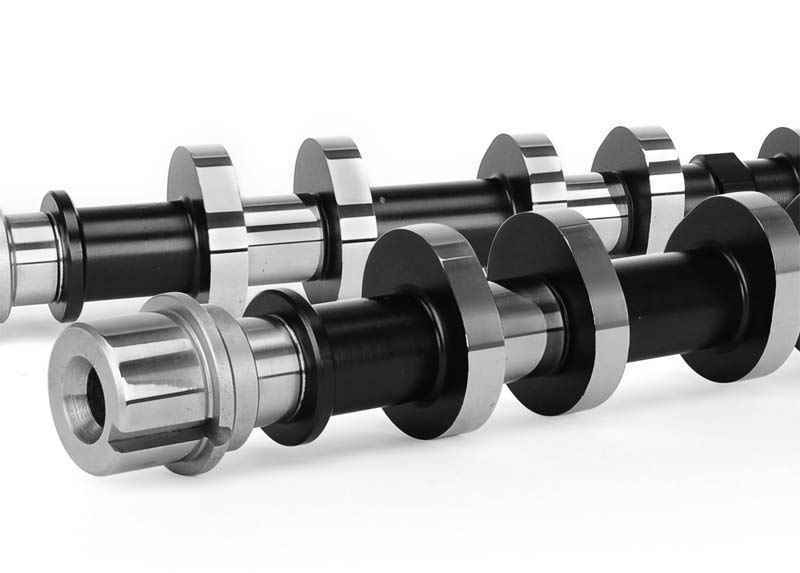 This particular design was inspired by a car engine camshaft. A domed case top and curved crystal also provide harmony and comfort around the wrist, which most timepieces don't. It required several months of intense work to produce an excellent and harmonious aesthetical balance for the watch case design. The choice of chronograph Swiss movement and dial design creation could then start accordingly with this DNA hereby born. Most round face watches are often made with "cold stamped" or "Punch press" techniques. 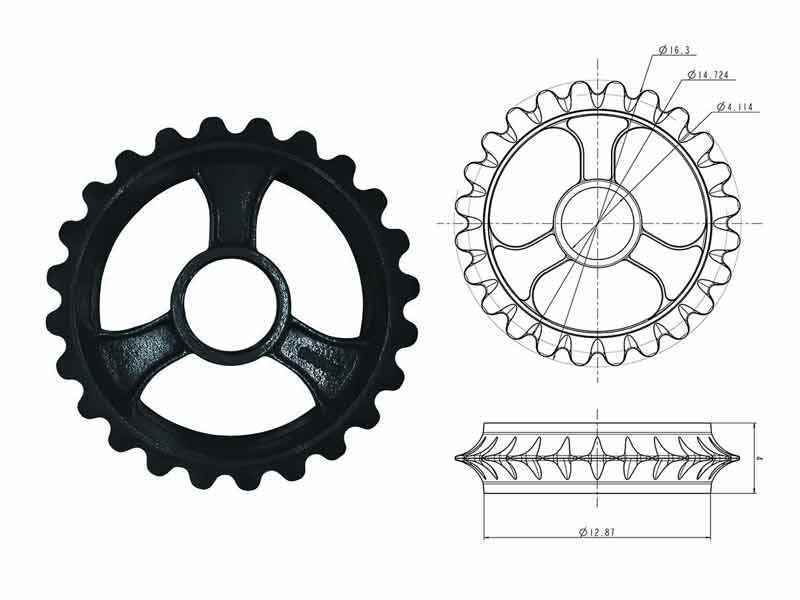 Due to the intricate and complex design of the Wryst casing, CNC machining technology is used (Computer Numerical Control). CNC Machining is a process used in the manufacturing sector that involves the use of computers to control machine tools. Tools that can be controlled in this manner include lathes, mills, routers and grinders. The costs for making the Wryst cases are higher than for regular round watches. This is another signature asset for the Swiss brand Wryst. “Wryst Racer” is a nice, catchy name but I believe for legal reasons, Wryst was not able to publish the “Wryst Racer” term, perhaps because it is too close to “Wrist Racer,” which is owned by someone else". This assumption is false. 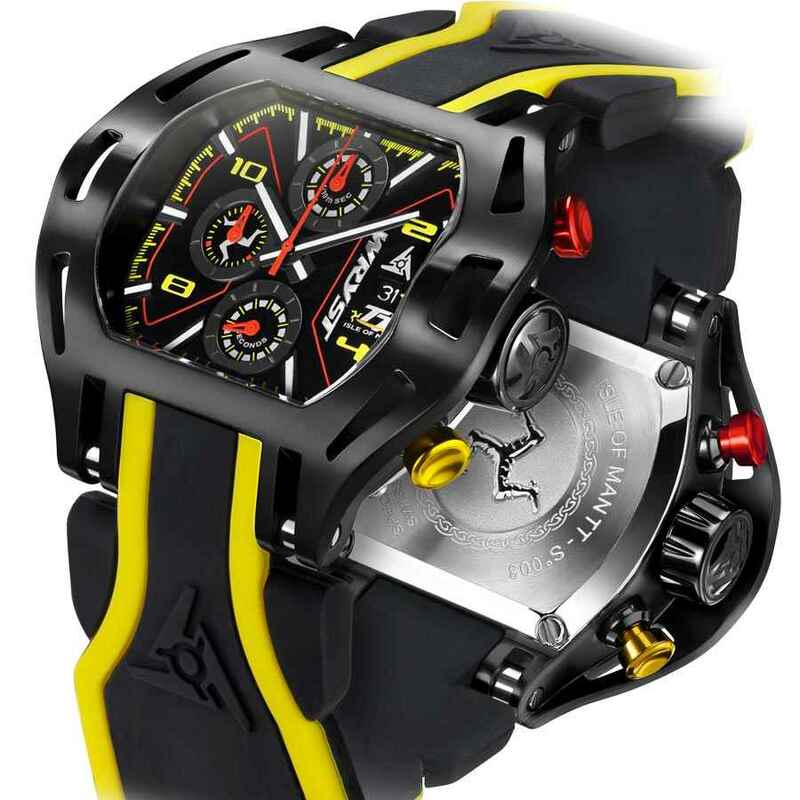 Firstly, the name "Racer" has been chosen with car racing and motorsport in mind for this watch collection. And secondly, we have also done some research on our end. There are no legal trademarks under the name "wrist racer" registered to this day. Somehow, Ariel Adams did not do the researches he claims he did. Or awkwardly did not do this properly. 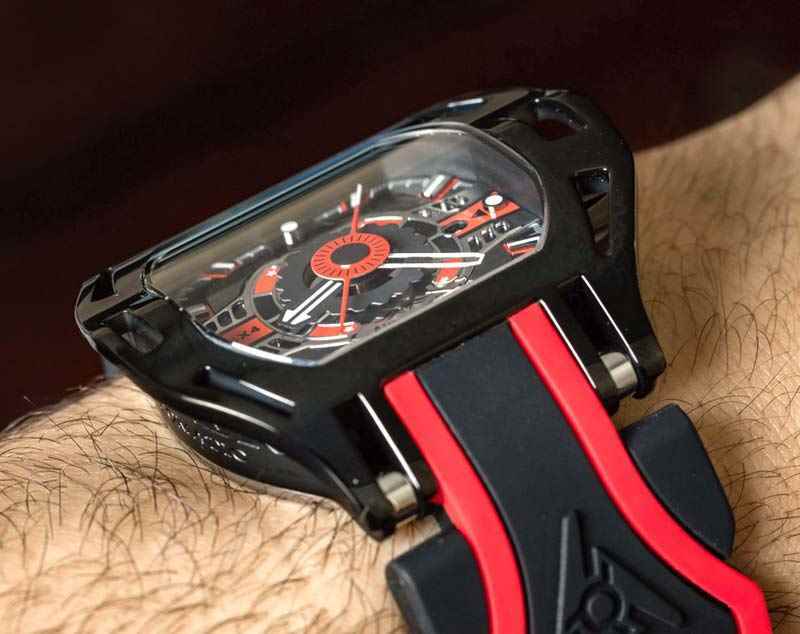 “Wryst gets a bit more specific and claims that its timepieces, with the distinctly wide case shape and the overall brand theme, are inspired by the Isle of Man TT race". Yet another untruthful statement from Ariel Adams who is truly confused and misleading in the Wryst review. The original design from Wryst was created between 2010 and 2012. The Isle of Man government contacted the brand is 2015 in view to discuss becoming the official timing partner of the world's fastest road racing the Isle of Man TT. So three years after the watches were already on the market. The link between the TT and the Wryst TT watch are the use of the IOM triskelion emblem, and most importantly the colors red and yellow. The Wryst Isle of Man TT watch is another version of the existing larger case design used for the earliest Wryst Force and Wryst Racer collections. “I did some research and found a series of toys from the early 1980s up to the present that are “wrist racers.” Some of these products even have visual designs that aren’t too far away from the Wryst Racing Automatic SX4. It leaves open various questions about what inspired the design. I think it is safe to say that the wide case, with its skeletonized flanks, is directly inspired by oblong race car steering wheels. Not that the aesthetic integration is particularly neat, but I think it is where the overall case design comes from". Wrong again! As explained above, the aired case flanks design is not inspired by an "oblong race car steering wheels". 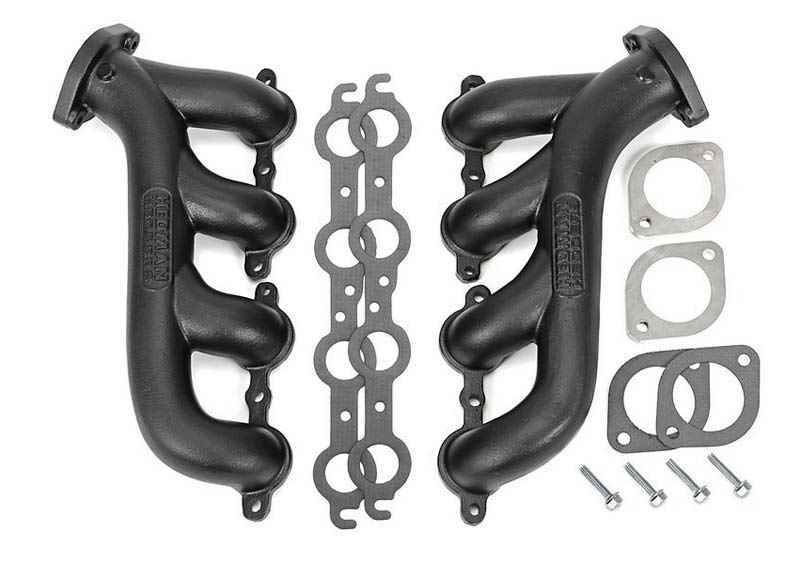 Instead one can attribute the shape resemblance to a race car engine manifold as explained. Nice try but it is amateurish and childish to think that the Wryst design has been inspired by Ferrari and Lamborghini copyrighted radio controlled cars. A more appropriate "wild guess" can be expected for someone like Ariel Adams who has been reviewing hundreds of luxury watches for so many years on Ablogtowatch.com. It goes to show that experience did not lead to a good level of professionalism in this instance. Therefore we can deny another childish assumption of Ariel Adams in his Wryst review where he compares the triangle shape to a "Spiderman logo-style legs". Again, the brand is not inspired by either children toys or superhero comics. Concerning the dial of the Wryst Racer SX4, these are some details about the inspiration behind it. 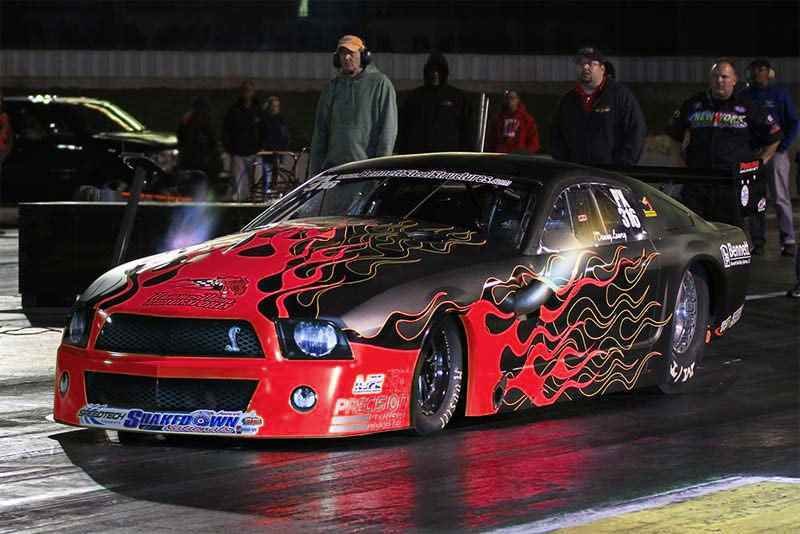 We find obvious that all aspects of the layered automatic watch dial have to be en-par with motorsports. The hour hand is shaped like a notched wheel. This is inspired by the wheels running the automatic Swiss movement Sellita SW-200, and the ones found in mechanical engine gearboxes. The three openings on the left and right sides of the face are a tribute to six cylinders V6 engines. We hope that you have learned more about the watch design Wryst and the inspiration that makes the atypical Swiss brand. Any comment about this Wryst review is welcome and you can contact us at any time if you have further questions. We are always happy to help and give details about Wryst review and anything else you always wanted to know.